Around 4 p.m. (CDT), police escorted a heavy-duty Terex crane into Robert E. Lee Park in uptown Dallas. Teams of workers toiled for at least three hours to cut underneath the statue’s base. Using a power saw and a crowbar, they dislodged the 14-foot tall, six-ton equestrian bronze statue depicting Lee and an unknown Confederate soldier from its stone pedestal. As they did, crowds of locals grew, many snapping photos with their cell phones. Police surrounded the area. Minutes before 7 p.m. workers hoisted the statue onto a flatbed trailer and transported it to Hensley Air Field, a city-owned storage facility. The statue, dedicated in 1936 by President Franklin D. Roosevelt as part of the Texas Centennial, will remain shuttered until an appointed 20-person Confederate task force figures out what to do with it. In mid-August, Dallas Mayor Mike Rawlings announced the formation of the task force in response to violence at a Charlottesville, Virginia, protest. He charged appointees with developing solutions over a three-month period, later advising elected officials on whether or not to remove Confederate monuments. Days later, the mayor, who called the statues “dangerous totems” and “monuments of propaganda,” sped up the process. He changed the date council members would vote on task force findings to November 8. Then, on August 28, three of the four black council members suddenly submitted a resolution to the city, demanding the immediate removal, disposal and/or relocation of all Confederate monuments located on Dallas public land. The document also commanded renaming public parks and streets with any ties to the Old South. It asserted that Confederate figures and symbols “preserve the principles of white supremacy.” The resolution altered the roles of task force appointees, too. Council members no longer required input on the sculptures’ fates. They wanted suggestions on costs and where to store or relocate downed monuments. Mayor Pro Tem Dwaine Caraway, who previously voiced support for Rawlings’ 90-day process, led the resolution revolution, bumping up the November 8 vote to September 6. The task force met for the first time on August 31. Last Wednesday, Dallas council members passed the resolution 13-1 with one abstention. 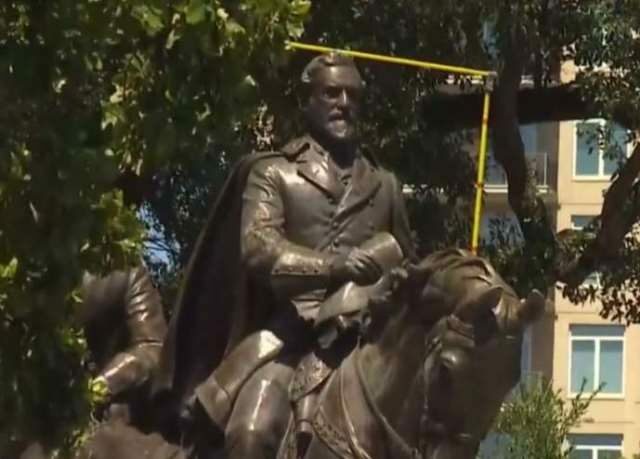 Within hours, crews began removing the statue until a federal judge stopped them with a temporary restraining order (TRO). Dallas resident Hiram Patterson and the Texas Division of the Sons of Confederate Veterans filed a lawsuit against the city freezing the statue’s removal. The next day, though, the judge dissolved the TRO. He said the plaintiff failed to show it would likely succeed if the case proceeded, a requirement to keep a TRO in place, according to WFAA. This cleared the way for Dallas city officials to remove Lee’s statue. On Sunday evening, an 18-wheeler carried a crane in from Houston. Tragically, a freeway crash killed the tractor-trailer driver and damaged the crane. The Dallas Morning News noted the difficulty of finding another crane capable of moving the massive metal structure as most machinery remained in Houston to aid Hurricane Harvey recovery efforts. Caraway initially estimated removal and storage costs for two Confederate monuments at $4 million funded by “excess revenue.” The price tag on Lee’s likeness has fluctuated from $600,000 to $400,000 and back up to $500,000. Beyond public comments at last week’s city council meeting, it appears Dallas taxpayers have had little formal input on this issue. A recent NBC DFW poll showed 79 percent of respondents opposed removing Lee’s statue. Only 21 percent agreed. The Dallas newspaper surveyed 503 registered city voters. Only 29 percent called for statue removal. Fifty-seven percent preferred a fictitious alternative plan where statues stayed beefed up by historical facts. Beverly is a native Texan, a U.S. military veteran, a graduate of the University of Texas at Arlington, and an area business owner. He believes the city’s decision to remove Lee’s statue was largely political, questioning why no brouhaha erupted out of City Hall over a downtown Fair Park statue of R.L. Thornton, a past Democrat Dallas mayor and a prominent Ku Klux Klan figure.